MiiPC is a multifunctional all-in-one device for your entire family or business organization. It’s a desktop computer, media center and gaming console all in a single device. With MiiPC, anyone can surf the web, play games, watch videos, run business apps, and edit documents with access to over 800,000 Android apps. You set up different user accounts for each person in your family or organization and each person can have their own private MiiPC desktop. And it's all protected and managed by you. MiiPC can run many web or Android apps like productivity, communication, education, entertainment, media and social - even without Internet connectivity. With precise PC-­like browsing experience including Flash* support, MiiPC delivers many of the desktop features to which people have grown accustomed. Whether MiiPC is your family’s primary computer or your business Kiosk computer you’ll find there’s no reason to compromise on features and performance! 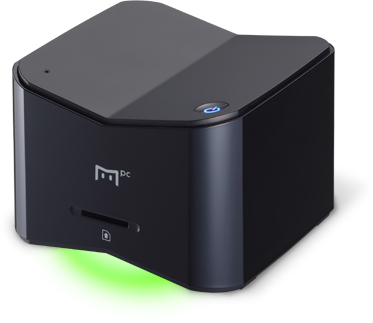 MiiPC is a high performance green mini-PC capable of running a wide variety of applications while consuming only 5-10W of power. This is about 10 times less than the average computer! Powered by Android OS, MiiPC gives your family or business access to a world of Android and web apps to expand the functionality of the device. Download apps and games to MiiPC and your family gets a world-class experience like on an Android phone or tablet. Stay online and the MiiPC web browser delivers a fast and high quality experience. With access to 800,000+ Android apps, 500+ hand-picked web apps from the MiiPC Web App Center and full Internet browsing, your PC becomes a computing hub for learning, entertainment, fun and communications. MiiPC comes with powerful cloud-based remote control features. For families, MiiPC can protect the online safety of your kids without compromise. You can remotely monitor and manage what your kids can access as well as establish time limits. For businesses, the cloud-based admin control mobile app enables remote user management including user creation, app access, usage reporting, and real-time monitoring. Like a desktop PC, MiiPC lets you work offline when you need to focus, play your own media, or when you don’t want to rely on the web. But MiiPC shines when you want to stream content, Skype your family or coworkers, or play online games with friends. MiiPC was designed for ultimate functionality so even when your Internet is down or experiencing problems, you and your family or business can still find use in offline mode. MiiPC delivers a world-class Android experience but is optimized for the needs of a family or business PC. The device allows you to build a big screen desktop hub, rather than try to organize multiple disconnected and unmanaged devices. MiiPC can finally give you a one-box solution for homework, communications, gaming, and for Friday night family video time with an amazing big screen experience. One device capable of doing multiple things - desktop computer, gaming console, and media center all in a single device. MiiPC for Home gives you the ability to share among multiple family members with large screen connectivity and optimized to provide a true keyboard and mouse desktop experience. MiiPC also provides real-time parental control feature like no other device. We successfully completed the MiiPC Project some time ago. Since then, we have switched our focus to other projects. We are very willing to discuss a proposal for an interested group to take over the MiiPC project’s intellectual property. This would include all source code and documentation for the MiiPC firmware, supporting mobile apps, Cloud-based server code and hardware design and tooling.